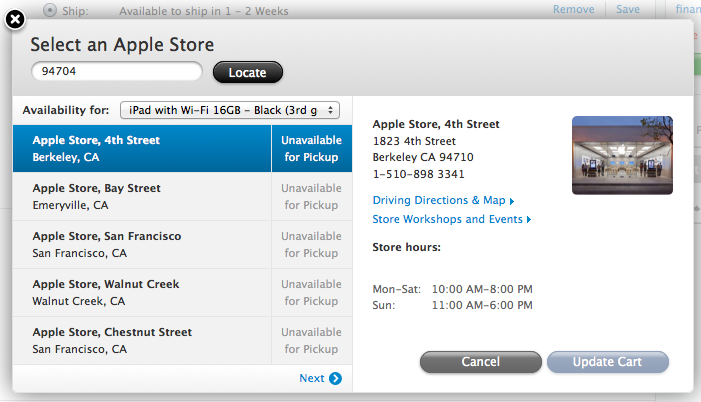 Apple has re-enabled the in-store pickup option for online orders of the new iPad, though most retail stores still register as "Unavailable for Pickup" as the company works to meet heavy demand for the new tablet. The in-store pickup option was reportedly unavailable on Apple's website during the first few days of new iPad sales, last Friday to Monday, according to one reader. The option has since reappeared, though AppleInsider was unable to find any stores that were available for pickup on Tuesday evening. Record demand for the iPad pushed estimated shipping times to as high as two to three weeks days before the the device launched. Apple gave some indication that it has improved supply of the tablet when quoted shipping times dropped to one to two weeks on Tuesday. Apple announced on Monday that it sold three million iPad units during launch weekend. Senior Vice President Philip Schiller called the device "a blockbuster," noting that it was the "strongest iPad launch yet." Chief Executive Tim Cook said earlier on Monday that the executive team was "thrilled" with the iPad's record start. According to Piper Jaffray analyst Gene Munster, consensus estimates for Apple's launch weekend were likely in the range of one to two million. Unprecedented demand for the iPad has prompted some on Wall Street to raise their iPad estimates for the March quarter. For instance, Evercore Partners' Rob Cihra now expects Apple to sell 13 million this quarter, up from 10 million.